Have you ever planned on going to Cambodia? If you are planning on doing so, must visit a cafe called “Art Deli” in Siem Reap. These were just the few pointers. But among all, the art cafe, Art Deli, really stands out when it comes to food and comfort. You might be wondering what is so special in this cafe that we are mentioning it specially. Before we let you know about what makes it the coolest, let me share some information about Art Deli first. 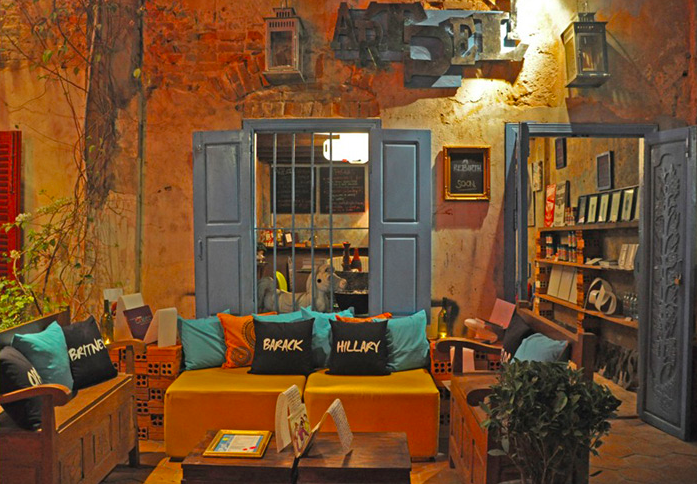 This is an art cafe in Siem Reap, Cambodia. You will find it on the walkway behind Pub Street, located along Alley West. This is built in a colonial house, which is extremely old. It shows how the old buildings are put to good use here, and not demolished. Now coming to the main point in hand, what makes Art Deli the coolest? For starters, you will find a lot of quirky pieces of furniture and decorations placed at every corner of the cafe. This creates a very light and fun mood to sit and have a cup of coffee with your companion. Imagine how wonderful it feels after you come back from the tour of the city, and relaxing here with a bottle of beer in your hand. Not just this, you can also buy some amazing art pieces from this cafe. Yes, it sells art as well. Since this is built in a house, most of the original homely structure was preserved. Hence, it also gives you a great homely feel too when you sit here. The backyard area of Art Deli is pure love. This backyard area is basically just a small space in between 2 buildings, which the cafe owner turned into an open air lounge. Overall, this makes a perfect hangout place, specially when you are with your group of friends. Does Cannabis kill Cancer Cells?